Some months ago, the owner of the store where I buy my cheese and yoghurt cultures, gave me a small jar with some kefir grains. He knew I was looking for it, asked his customers, and one gentleman happened to have some extra to share. When Paul, the store owner, called me to come to pick up my grains, I was as happy as I could be: I was looking for live kefir grains for a long time. I took my little cooler, where I prepared an ice bed for my new "babies", got in the car and drove to the store. Another pleasant surprise was in the store: I wasn't charged for the kefir grains, it was donated to me by the gentleman. Thank you! I drove back slower than usual: I didn't want to disturb my little grains. At home I placed the grains in a half gallon (2 liters) jar with a whole milk and patiently waited util next morning. The reward was worth all the waiting and asking around: kefir was born, and is still alive (in 2-3 batches a week). I make the kefir from a whole cow and goat milk, last one being milder than forerun. Kefir can also be made from soy milk, and even a water. We drink kefir as is (raw kefir has an incredible qualities, responsible for health and longevity of people in Caucasian region in Easters Europe), use it in salads, soups, and cooking. However, temperature above the 40 °C / 104 °F would kill the culture, hence would reduce all health benefits. Both, cucumbers and kefir have to be chilled. Cut the cucumbers to a desirable thickness, and set aside. Mix 1/2 cup of kefir with a salt and dill, pour over the cucumbers and enjoy. Your can place covered bowl with the salad in the refrigerator for two hours for all flavors to blend. Easy, healthy, and refreshing. This salad would make you happy on a hot summer day! Do you drink kefir or use it in any recipes? This is incredible. My daughter would love this. I'm lazy and I go for store bought kefir, but usually drink it as a snack at 11:00, sometimes I use it for smoothies but I have never thought about using it in any recipe. 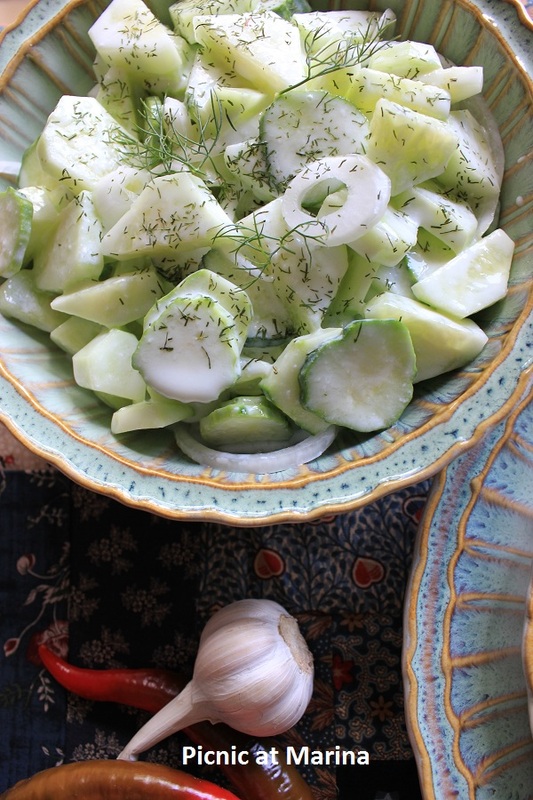 But your cucumber salad is a great summer chiller soI have to try this recipe. I have learned something new! This is the first time I've heard of kefir. Where would I find it in a grocery store? This is a perfect salad for us here. Our weather is crazy hot! Love kefir, but I never tried myself!!!!! This salad looks fresh and amazing!!!! How nice that he donated it to you! I've never heard of kefir before is it sort of like yoghurt? 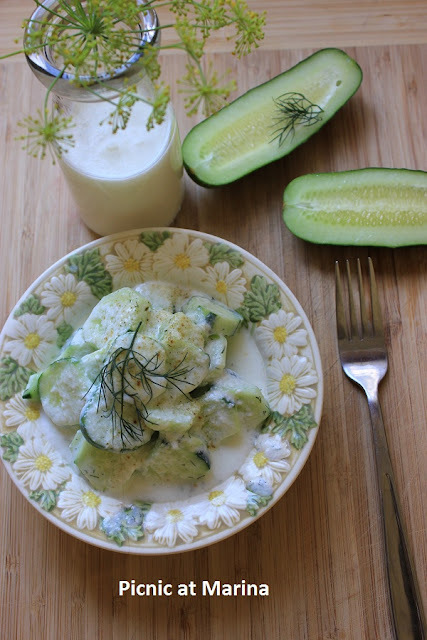 Hi Marina, I see that 'great minds think alike'...so happy to see we post posted cucumber, and dill recipes. I love kefir, but have not made my own. I usually buy the fruit flavored ones, and drink it like a shake. What a clever and cute idea the way you made your own, and combine it with the cucumbers. I certainly would love to try it...sounds so refreshing and delicious! this sounds amazingly fresh and satisfying! What a refreshing salad Marina. I love cucumbers particularly in the summer, such a fresh taste. Now I'm going to look for your rye recipe...Have a great weekend. I know nothing about kefir, will google to learn more. Thanks for the introduction. I do very little with kefir - my lose. It's great combined with cucumbers alone, and dill is extra nice. Good stuff - thanks.